The Arsenal-Internetosphere, which certainly never panics or exaggerates anything, has been in a full-on tizzy this week after another scoreless home game. And, I don't intend to sugarcoat anything, it certainly is becoming a problem that Arsenal cannot score goals at home. It's not good that Arsenal have already dropped five points at home; the last two Premier League champions only dropped four points at home in the entirety of their title-winning seasons. At the same time, this team is absolutely better than the three results thus far this season have indicated. Oh, but then Arsenal is drawn away to Tottenham in the third round of the League Cup on Tuesday, then yesterday gets drawn in the same Champions League group as Bayern Munich. The sky is well and truly falling! Although, a few notes: 1) Spurs haven't won yet this year. 2) Drawing Bayern from Pot 1 prevented Arsenal from getting drawn against tricky German sides from Pot 4. I mean, look at Manchester City's group. 3) We all know how this movie plays out and I look forward to finishing second and drawing some behemoth in the Round of 16. 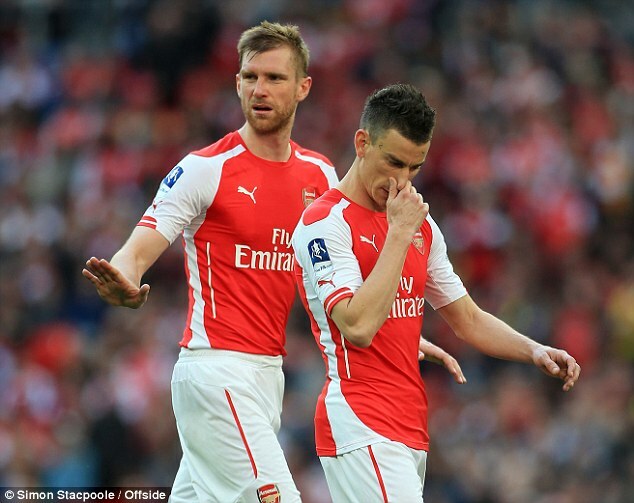 Well, Laurent Koscielny's back... no no, he's probably not returning, I mean he's got a back injury. And the word is Per Mertesacker is "likely to miss" the trip as well. It's a good thing Arsenal have depth at center back this season. It's a bad thing that that depth looked... out of its depth at times on Monday. Monday's match against Liverpool was the first time since April 16, 2012 that Arsenal started a league match without both Per and Kos; that was a 2-1 loss to Wigan, which included a back four of Bacary Sagna, Kieran Gibbs, Tom Vermaelen, and Johan Djourou. A quote I read yesterday stated that Mertesacker is the least likely of the two center backs to feature, even though Per is only "likely" to miss the match, while the prognosis on Koscielny had looked much worse on Wednesday. Seems like a contradiction to me, though the turning of phrase regarding both players from Arsene Wenger stems from the fact that Kos could still theoretically pass a fitness test. Last year, when Arsenal met Newcastle in December, former Newcastle defender Mathieu Debuchy started alongside Mertesacker at center back. As for the rest of the squad, there was an update on Danny Welbeck! He "should be back after the international break." Predicted XI: Cech, Bellerin, Gabriel, Placeholder Center Back that I most certainly did not just accidentally leave in here, Monreal, Coquelin, Cazorla, Alexis, Ozil, Ramsey, Giroud. are suspended in midair due to some sort of witch's curse. It's odd to write a Newcastle preview where they don't have approximately 30 players out injured, as was the case for both fixtures against Arsenal last season. There are three definite absences from the Toon lineup: Emmanuel Riviere is expected to be out long term as he might need surgery on a meniscus tear in his knee. Sylvain Marveaux is out until mid-September with a groin injury, though his future with the club has been in doubt for some time. Curtis Good remains out with a hip injury he sustained in February. Defender Paul Dummett missed all of preseason training after he injured his hamstring on international duty in June; he returned to the bench for the club's midweek cup tie against Northampton Town. Siem de Jong played 90 minutes in that cup tie; it was only the second time in his Newcastle career that he was able to complete the 90. Moussa Sissoko is a doubt after he missed last week's trip to Old Trafford with a hip problem. Papiss Cisse is 75/25 with an illness. Daryl Janmaat was suspended last week after a red card against Swansea, but will return to the back line tomorrow. Predicted XI: Krul, Janmaat, Coloccini, Mbemba, Haidara, Anita, Colback, Wijnaldum, Sissoko, Obertan, Mitrovic. ...it was against Northampton Town. Arsenal's home form is garbage! How garbage is it? It's so garbage that this isn't even a home game and I still feel like I have to talk about it! The 0-0 draw with Liverpool earlier this week marked the fifth league game at the Emirates out of the last six in which Arsenal were held scoreless. Scoreless! That's Liverpool and West Ham from this season that you can add to the list of teams that have kept clean sheets at the Emirates since April; the other three were Chelsea, Swansea, and Sunderland. Arsenal have only found the net at home against West Brom, in that dead rubber match at the end of last year, since the 4-1 win over Liverpool on April 4. Away from home, however, Arsenal have not lost since February 7 at White Hart Lane (where they will have to travel for their third round League Cup tie next month.) Arsenal have not had the same struggles scoring away from home as they have had at the Emirates; you have to go back to New Year's Day to find the last time Arsenal were held scoreless in a road fixture. Newcastle have won just once in their last 14 league fixtures, dating back to last season; they won on the final day of the year against West Ham, 2-0. An eight match losing streak in March and April thrust Newcastle into relegation danger and the near-total collapse led to the sacking of caretaker manager John Carver in June. Ex-England manager Steve McClaren is in charge now; with England he was, of course, most well known for failing to qualify for the 2008 Euros. The Toon have yet to win in the league so far this season, though they did pick up a 2-2 draw with Southampton on opening day and took a 0-0 draw from Old Trafford last weekend. They lost 2-0 at Swansea in the season's second week, while earlier this week, won their second round League Cup tie over League Two's Northampton Town, 4-1.
wasn't last year's kit, so it's from the year before. 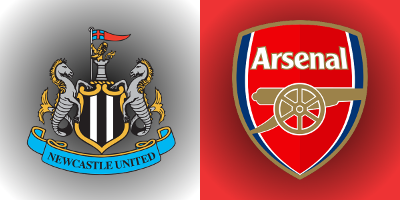 Newcastle were one of only seven teams in the league whom Arsenal defeated twice last season. At the Emirates in December, both Olivier Giroud and Santi Cazorla scored twice in a 4-1 victory for the Gunners. 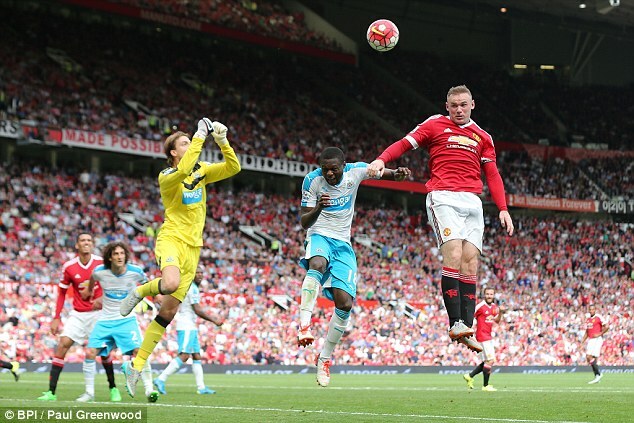 Ayoze Perez scored for Newcastle in the 63rd minute, which had pulled the score back to 3-1 at the time. Cazorla scored the finally goal with a chipped penalty, which led to numerous pundits complaining idiotically about sportsmanship. Arsenal won at St. James' Park 2-1 in March, in what you could call a class Arsenal-style match: Olivier Giroud scored twice in a comfortable first half and Arsenal coasted to a 2-0 lead at halftime. Then, Moussa Sissoko pulled a goal back in the 48th minute for Newcastle, and suddenly it was the most nerve-wracking match ever played. Arsenal have won seven straight against Newcastle and are unbeaten in their last nine against the Toon dating back to November of 2010, when an Andy Carroll header gave Newcastle a 1-0 win at the Emirates. Arsenal then drew two straight visits to St. James' Park before winning these seven straight. Olivier Giroud has scored eight goals against Newcastle in six matches, finding the back of the net in five of those six games. The referee is West Midlands-based Andre Marriner. After Marriner found himself in the middle of ridiculousness, sending off the wrong man in Arsenal's 6-0 loss at Chelsea two years ago, he was assigned to only two Arsenal matches last season, both home wins and both clean sheets. 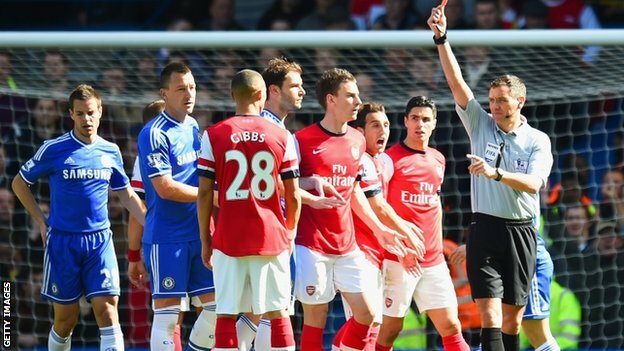 Marriner was the referee for Arsenal's 1-0 win over Southampton last December and their 2-0 win over Everton in early March. The club successfully navigated Kieran Gibbs and Alex Oxlade-Chamberlain both starting the latter match, with the Ox being subbed off after 82 minutes. Newcastle had a mixed record with Marriner last year. They defeated Liverpool 1-0 in November, but then lost 4-0 to Tottenham in the League Cup in December. Later, they played a 1-1 draw with Crystal Palace in February with Marriner in the middle. After the mistaken identity red card back in 2014, Marriner showed only two red cards in 33 matches last season, one to Bournemouth's Yann Kermorgant, and the other to Hull's David Meyler. John Painting is a contributing writer to The Modern Gooner and a full hybrid electric mid-size hatchback. You can follow him on Twitter @zorrocat to debate fuel economy.